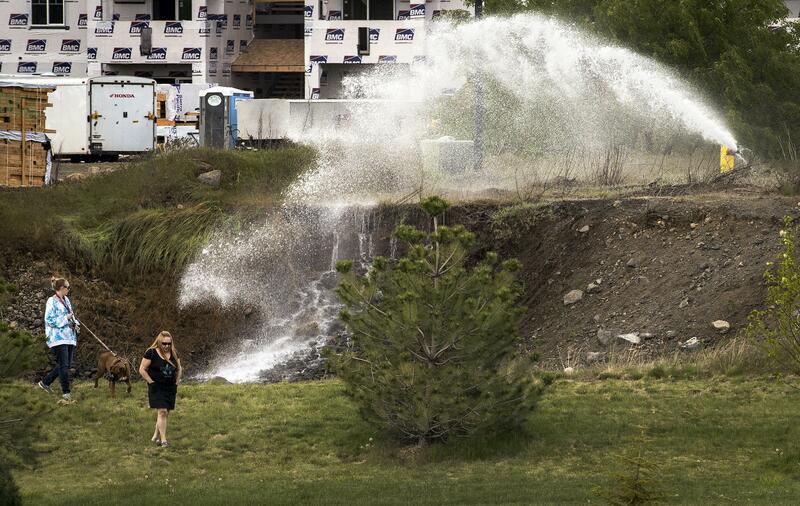 UPDATED: Thu., June 8, 2017, 8:50 p.m.
Airway Heights officials said Thursday that the city’s water supply is now safe to drink. On May 16, Airway Heights residents were first advised not to drink or cook with water from city pipes because of contamination in several wells due to chemical use at Fairchild Air Force Base. Airway Heights’ water supply already was connected to the city of Spokane’s. Since the discovery of the high levels of contamination, the city began to flush its pipes with Spokane water. But it took three weeks for enough of Spokane’s water to clean out the system to levels considered safe to drink. Airway Heights tested all the wells after flushing them with Spokane’s water to see if they were safe, said Kevin Anderson, the city’s public works director. All were except for one, rarely used well north of Airway Heights. That line has been capped, Anderson said, and will remain so until the water is deemed safe. The perfluorinated chemicals contaminating the water were known by the acronyms PFOS and PFOA, and were key ingredients in a fire-extinguishing foam that was used for decades at Fairchild and other bases around the country. The chemicals are believed to have seeped into groundwater from a fire training site on the eastern edge of the base. Scientists have yet to gain a thorough understanding of the chemicals and their effects on the human body, although decades of research have linked them to an array of health defects, including high cholesterol, thyroid disease and pregnancy-induced hypertension. As Airway Heights, the base and other entities scrambed to provide clean water to the community, it was determined that the water being drawn from Spokane isn’t enough to supply Airway Heights adequately, said city manager Albert Tripp. That will likely mean some type of water restrictions, possibly as early as next week. Any water restriction must be approved by the City Council and would likely mean establishing an odd-even day watering schedule. Although Spokane can pull as much water as needed from the aquifer, Anderson said how much Airway Heights can receive is limited by the connections to Spokane’s water system. Anderson said city officials are weighing their options. They may tap into other Spokane lines. Or, they could tap into a Fairchild Air Force Base water line that runs through the city of Airway Heights. The city also could install a water filtration system. The temporary water restriction will give the city some time to consider options, Anderson said. “We want to have the best route going forward,” he said. The cost of piping water in from Spokane is not yet known, nor is it clear if the city or the military will pay for the expense, Anderson said. Local restaurant owners were relieved to hear the news. Pat Smitarmarn, the owner of Sala Thai, said he’s seen a 30 and 40 percent drop in business over the last month. “It hurt bad,” he said. He hopes now customers will start to return. Wolffy’s Hamburgers owner Justin Davis also said his business was down significantly. Customers were suspicious about where their water was coming from. “The biggest thing is the customers are scared,” he said. At first the city provided restaurants with potable water, Anderson said. However, Fairchild took over water distribution to restaurants and other commercial food operations, Anderson said. Smitarmarn was given 100 gallons a day, although he only used between 50 and 60 gallons, he said. In his restaurant Thursday, large boxes of water were stacked against one wall. Wolffy’s also received 100 gallons of water per day, Davis said. Additionally, the city rented food-grade milk trucks to provide bulk water deliveries to larger operations, like Cyrus O’Leary’s Pies production facility, Anderson said. Published: June 8, 2017, 1:26 p.m. Updated: June 8, 2017, 8:50 p.m.